Computer – check. Audio interface – check. Studio monitor speakers/headphones – check. But what’s missing? A MIDI controller! Whether you plan on making electronic music, or recording other genres but need an extra tool for managing plugins, parameters, or inputting drums, you definitely need a MIDI controller. However, with so many various models out there, finding the right one for your needs and budget can be a very tricky task. Luckily, you’ve come to the right place. In this article, we will go over the advantages and use of MIDI controllers, the different features and specs they can offer, as well as some of the best models that you can currently get. If you don't know where to get started, jump straight to our buying guide found below our top picks. Great controllers can come with small price tags. The minimalistic design and intuitive controls make this a great starter controller. 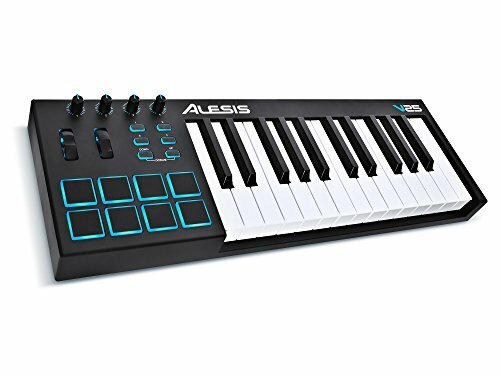 If someone tells you that you can’t find a good MIDI controller for under $100, they definitely never tried out the V25 by Alesis. Alesis is a company that may not be as famous as Akai, Novation, or M-Audio, but can certainly make excellent MIDI controllers. The V25 rocks a pretty minimalistic design, which not only makes it look nice and sleek but very easy and intuitive to use as well. If your studio desk is already crowded, the V25 might just be the right model for you. It’s relatively compact and with a slim profile. If you still find it too big, don’t worry, as it’s amazingly lightweight and you can easily stuff it somewhere else when you’re not using it. The semi-weighted keys were an option that was expected, as it sits in the middle between price and the best and most natural feel. They feel very solid and require a nice amount of pressure to actually be activated. There is, of course, the option of choosing the most appropriate velocity curve for your personal preferences as well, giving it a nice touch of customization. The left-hand side features 8 drum pads, each with 4 different presets, giving you a total of 32 differently programmed pads. Alesis even included 8 different velocity curves for the pads as well, so no matter what you’re used to in terms of tactile dynamics, you’re bound to make the V25 feel comfortable! Besides the 2 wheels for pitch and modulation, this model offers 4 programmable knobs. Sure, some users may find that 4 may not be enough, but for beginners and basic users, this should do the job just fine. Just have this on your mind if you plan on using it for live performances! When it comes to DAW compatibility and overall usability, the V25 is just excellent. Simply plug it into your computer, and your DAW of choice should recognize it in no time. The basics are easily used without any software, but for any additional settings and control, you can always download the appropriate Alesis software pack. All things considered, the V25 by Alesis packs a lot of handy and useful feature at a more than reasonable price point. Definitely a model worth considering. Beginner friendly at a great price. Controls your DAW and has great-feeling keys in the budget price range. Next up we have the Impact LX25+ by Nektar. As far as around $100 MIDI controllers go, this model seems to offer pretty much everything a beginner/more advanced user might need! Though you’d expect a 25-key controller to be pretty compact, the LX25+ is a bit larger than you would expect. Most of the buttons and knobs are placed above the actual piano keys, as well as on the left-hand side, so do have that in mind if you already don’t have much space left. The actual keys look and feel pretty good. At first glance, you might think that they’re semi-weighted, but they are actually synth-action ones. While this may not be that appealing to pianists, there are definitely some pros to this type of keys nonetheless. The fact that you don’t need to apply too much force on them means you’ll probably be able to play around for a long time without getting too tired. The LX25+ also offers adjustable velocity for the keys, so you can either set it to the value you find to be the most comfortable, or change it each time you’re working on a new project. It’s pretty clear that this model focuses on users that need something more than just simple piano keys. There are 8 fully- programmable pads on the top right-hand side of the device, as well as 8 knobs in the middle. The pads can either be mapped out automatically or manually, giving you that extra level of customization, if that’s what you’re into. So, piano keys, pads, and knobs seem to be great. But what about using the LX25+ to control your DAW? This is one of those controllers that seamlessly integrates with most of the commonly used DAWs, so compatibility shouldn’t ever be an issue. As you can use the LX25+ to control the most important functions in your DAW, you can easily rely on it and forget about using your mouse (for the majority of the time). Another great feature that’s pretty neat but rare as well are the transpose buttons. Instead of changing octaves, you can easily transpose the keys up or down. This is a beginner-friendly feature that some of the more advanced users will appreciate as well! 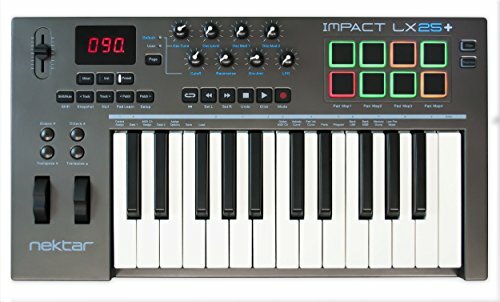 So, if you’re looking for a versatile MIDI controller that covers all the basic and slightly more advanced needs, definitely consider the Nektar Impact LX25+. The most compact controller on our list. The very low-profile keys and small frame is great for those that are short on space or travel. 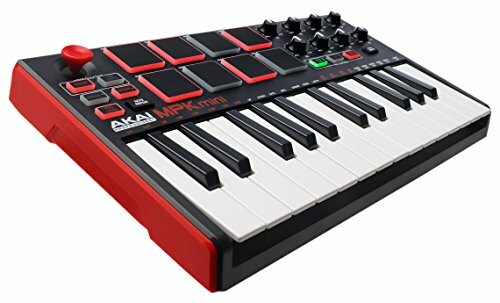 Going for a MIDI controller coming from Akai has never been a bad idea, and the MPK Mini MKII is certainly no exception. For around $100, you’re definitely getting your money’s worth, if not even some more! As the “Mini” in the name already suggests, the MPK is pretty petite. Not only does it have just 25 keys, but they are noticeably smaller. All of the other knobs, buttons, and pads are crammed in pretty tight, so the footprint of the device is as small as it can get. If you’re a traveling musician, or simply want something that you can easily pop in your backpack, the MPK Mini MKII may just be your best option. As I just said, the keys are noticeably smaller than the ones you probably encountered so far. This does take getting used to, especially if you have large fingers and/or fingers. With synth-action keys, you can play crazy fast without getting too cramped or tired. However, this model, unfortunately, doesn’t offer adjustable velocity curves, which definitely takes some dynamics out of your playing. The pads are located above the piano keys and are noticeably better than the ones you can find in the previous version of this model. The thick rubber makes using the pads a very comfortable experience, and they simply feel like they will last quite a long time. The rotary knobs are, once again, smaller than what you’d probably expect, but feel pretty solid nonetheless. The only con with the knobs would have to be the spacing between them, as they are pretty close to each other. Lastly, a pretty unique and useful touch, the 4-way joystick. It’s meant to replace the standard pitch and modulation wheels. Not only does it save space, but feels very precise and is easy to use. The MPK Mini should be compatible with most of the commonly used DAWs out there. You also get a software pack which includes a “dubstep making program”, Hybrid 3 which is a pretty handy plugin, and MPC Essentials which works straight out of the box. If the smaller keys and the lack of DAW controlling features aren’t a dealbreaker for you, the MPK Mini MKII may just be the best MIDI controller for your needs. Most configurable budget midi controller. With over 40 configurable buttons, this gives you a launch pad for controlling anything you need. So maybe you’re not that crazy about actual piano keys and need a lot of buttons? Maybe the APC Key 25 by Akai is the right MIDI controller for you! If it weren’t for the 25 piano keys on this device, it would definitely look more like a control panel for launching rockets than a MIDI controller. It’s actually funny how many buttons there are on this device, given the fact that it’s pretty darn compact. You can easily fit it in your backpack alongside a laptop and have a pretty decent setup for performing or recording electronic music. That being said, the keys feature synth-action, suitable for simple melody input or fast-paced playing. However, they do feel kind of mushy, so pianists should steer clear of this model. Don’t get me wrong, they still do the job, but there are definitely better controllers for this much money in terms of the key feel and action. Also, there are no pitch/mod wheels, as the other buttons and features simply squeezed them out of a form factor this small. It’s pretty obvious that the APC Key 25 mainly focuses on the plethora of buttons more than on the actual piano keys. There are 8 sets of 5 buttons, giving you a total of 40 different clips you can launch at any given time. That is, if you can remember what each of the buttons is programmed for! Other controls include a set of 8 programmable knobs, extensive scene launch controls, and knob controls. The individual buttons light up in 3 different colors, so getting around them shouldn’t be too hard. 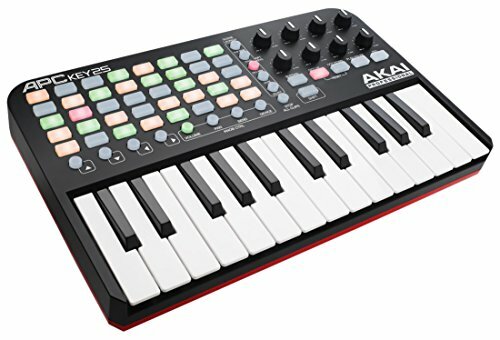 The APC Key 25 is compatible with any DAW which supports MIDI mapping, so you can control pretty much any parameter in the software without using a mouse or a regular computer keyboard. Ableton Live Lite is included with the device, but it really shows its full potential with Ableton Live 8 or 9, which you will have to purchase separately. The APC Key 25 by Akai is a true powerhouse for any EDM creator or studio engineer who needs a single device to control various parameters in their DAW of choice. For just around $100, it’s an amazing MIDI controller. Everything we loved in the 25-key Nektar with more keys and velocity curve features. 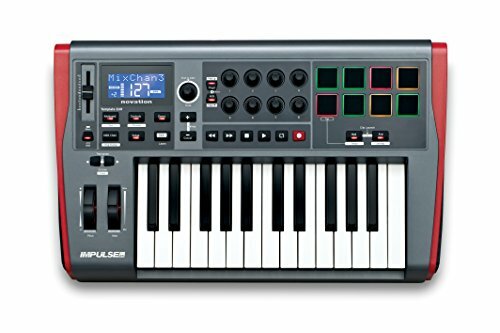 The LX25+ mainly focused on beginners that didn’t want to spend too much money on a MIDI controller. The LX49+ noticeably steps up the game, with a solid build, great design, and very useful features. In order to pack all of those knobs, pads, and faders, the LX49+ had to be pretty large. This is not a controller that you can simply push aside when you’re not using it unless you have a massive desk in your studio. The 49 keys are synth-action ones, but definitely, feel and perform better than the ones found on the previously mentioned APC Key 25. They are full-size, so pianists shouldn’t have any trouble transitioning from a real piano. As far as velocity curves go, the LX49+ is relatively limited, with “only” 4 curves to choose from. However, chances are that you wouldn’t really use the other 4 you can find in most other models. This model is more about the other functionalities, which you can easily access and control via the buttons, pads, and faders. The 8 pads are pretty similar to the ones on the LX25+, and whether you prefer manual or auto mapping, they will definitely give you a satisfying user experience. Next up, we have the 8 knobs as well as 9 faders. The faders can be set up to control 8 channels in your DAW, while the 9th stays assigned to the currently active and selected channel for added convenience. Additional buttons can be found below each fader, and they correspond the channel assignment as well. All in all, you’ve got advanced control over the parameters and different channels in your DAW without even having to look at your computer screen or use your mouse and keyboard. After a quick installation of the Nektar DAW Integration, you’re basically good to go. Depending on the DAW you’re using, the process will be a bit different, but straightforward and fast nonetheless. Mapping, remapping, and setting all the parameters is intuitive and beginner friendly! So, is the LX49+ worth the around $200 price tag? If you’re looking for a solid MIDI controller with loads of programmable buttons, knobs, and faders, that’s easy to set up and use, then definitely yes! Great for amateurs who are looking for more control. Plenty of space, pads, and configuration knobs and buttons to ensure everything you need to control is in one place. 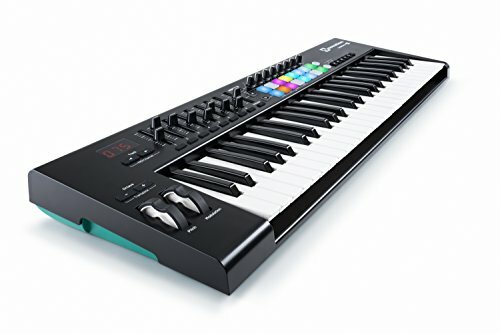 At number 6, we have the Launchkey 49 from Novation. This brand is known for making some of the best MIDI controllers on the market for around 20 years now, and the Launchkey series is definitely no exception. The MK2 version of this model means that a couple of things have changed from the first version. However, I found only improvements, with the feel and quality definitely being at the same level if not at a higher one. The keys are synth-style, and, of course, velocity-sensitive. Even though they are not weighted, they still feel pretty premium and solid. Definitely a great choice for anyone looking for a snappy setup which allows fast-paced playing. However, it’s the rest of the keyboard that really makes it special. The Launchkey 49 is an excellent tool for both performing live and controlling your DAW. There are 2 rows of 8 pads, for a total of 16. They are backlit, fully programmable, and velocity sensitive. Whether you mostly use pads for launching clips or inputting beats, you will definitely like how they feel and perform. Above the mentioned pads, are 8 knobs, which, as expected, are fully programmable. Mapping everything out is fairly simple if you have any experience working in a DAW. Most other models would stop here, but Novation decided to include more controls. With 9 faders (8+ master), you can pretty much cover all of the parameter controls you might need in your DAW. The Launchkey 49 comes with Ableton Live Lite, as well as a couple of other programs and samples. You can easily use this controller with a PC, Mac, or even an iPad (additional accessories needed). This is possible because the Launchkey gets all the power it needs via a USB cable. The iPad interface is slightly more simple but offers a great user experience nonetheless. All of the pads and faders are visible on the screen and can easily be programmed. Of course, if Ableton Live isn’t the DAW you’re used to using, don’t worry! The Launchkey is fully compatible with the most commonly used audio workstations and integrates flawlessly. All things considered, the Launchkey 49 by Novation is a powerful MIDI controller with a good range of programmable pads, knobs, and faders, that’s easy to use no matter the platform you’re on. The included software makes it a great value for the money. Semi-weighted keys and a great feel for a mid-range price. If you are looking for semi-weighted over synth keys in a 25-key model. This is the one for you! Yet another model from Novation, the Impulse 25 shows exactly how many neat features you can pack in a relatively small and compact MIDI controller. Unlike most of the other models we’ve mentioned so far, the Impulse 25 has got semi-weighted keys. They definitely feel better than the synth-action ones, but, as expected, don’t give you that speed that some may value more than the feel. Aftertouch is definitely a nice touch, as you can add a unique layer of customization even after you’ve actually pressed the keys. Again, this feature is, for some reason, not that often, at least when it comes to the models in the article so far. The 8 drum pads feel very solid and are nicely spaced out. AS they are multi-function, you can use them for anything from warping arpeggios, launching clips, or inputting various beats manually. Next up, the 8 knobs. They are endless rotary encoders and feel quite precise. Map them out to any parameter you want in your DAW and control it without using your mouse and keyboard. This exact model, with 25 keys, is noticeably smaller than the bigger ones with 49 and 61 keys. Unfortunately, no faders could really fit on it, so if you like what the Impulse line has to offer, but feel like faders are a necessity, consider getting the bigger ones. The only fader you’ll find is the single one on the left for the master level. Besides that, all of the other features are controlled via buttons and, of course, 2 wheels for pitch and mod. There is even a neat little screen so you can make sure you’re in control at all times, adjusting the right parameters and launching correct clips. As far as connectivity goes, besides the USB port for connecting it to your computer, there are 2 connections for sustain and expression pedals, as well as MIDI input and output. With Ableton Live Lite, Bass Station Synth, and other great programmes included, you can set the whole thing up in just minutes. So, is the Impulse 25 worth it? Well, if you value semi-weighted keys over synth-action, and don’t need that many pads, knobs, and faders, then definitely yes. The Code 49 from M-Audio is a great controller with a mid-range price tag. Check it out if you want something with a few more features and a bit more quality. M-Audio is known for making high-quality music equipment. Their Code 49 MIDI controller takes a unique and different approach and offers a very convenient and fun playing experience. Even though this is a 49-key controller, it’s pretty large. It’s almost the size of a 61-key controller, as the drum pads are on the left-hand side. As this model is a bit more expensive, it wouldn’t be fair to compare it to the other, sub/around $100 models that we’ve covered so far. You definitely get better quality with the Code 49. The keys are full-size and semi-weighted. The fact that they are velocity-sensitive gives a nice layer of dynamics, which, I’m sure, pianists will find to be pretty important. Besides that, aftertouch is featured as well, and it works noticeably better than on the just previously mentioned Impulse 25. What’s really neat, however, with the Code 49, is the split feature. It allows you to basically split the keyboard into 4 different, assignable zones, that you can modify and customize individually. By using this feature, you can keep the drums and other instruments on the pads and additional keys, and have the keyboard section divided into different presets. With the mentioned feature and 16 programmable drum pads, you’re never going to run out of buttons. They light up as well and are velocity-sensitive, so the drum tracks you tap out will sound pretty realistic. You can have everything under control by using the 9 faders. They are automatically mapped out for 8 channels + main, but can easily be reprogrammed. For extra convenience, there is also a small screen on the left-hand side. What really makes this model stand out is the X-Y Pad. This is a feature that we haven’t seen so far on this list. It allows you to set the X and Y axis parameter for different settings on the device itself. Besides that, you can use it to generate notes, or even as a trackpad for your computer! M-Audio really went all the way with the Code 49. There’s hardly a parameter you can’t control via this bad boy. If total control over your DAW is what you’re looking for, look no further. Need more pads? Look no further. 64 pads + 32 buttons gives you a ton of customization and flexibility. Oh, you need more pads? I think I’ve got you covered. The Launchpad Pro by Novation is exactly what it sounds like. A freaking launchpad! If you’re a pianist, you may want to skip this one, sorry! You basically have a grid made of 8x8 pads and a crazy total of 64 pads that you can program and play around with. All of the pads are, of course, backlit with RGB. While this may seem like only a flashy feature, it makes getting around all of the pads much easier. Dividing certain instruments or effects by color makes for a much faster workflow. The lights can even match up with the clip colors in Ableton for extra convenience! With pressure and velocity sensitivity, dynamics is no issue. The pads allow for very expressive and realistically- sounding drum beats and melodies. But, the pads are for much more than simply tapping out beats. The Launchpad can easily be turned into a conventional “MIDI keyboard”, although it definitely takes some getting used to. Play riffs, chords, launch clips, and toggle effects. You can do pretty much anything you want in your DAW with the Launchpad Pro. Besides the main 8x8 pad grid, there are 32 more buttons surrounding it. These buttons make getting around the device much easier. They basically cover the most commonly used controls, such as shift, click, undo, redo, delete, and others. Muting, panning, selecting tracks, etc. are all covered, so you won’t have to map them out on the main grid. That way, you’ll always have 64 pads at your disposal. As far as connectivity goes, the Launchpad keeps things simple. A USB connection, power input, as well as MIDI I/O is all you get. This way, you can connect the launchpad to other MIDI-enabled devices and control them via your set of pads. While the Launchpad pro is definitely interesting, I wouldn’t say it’s for everyone. For around $300 you’ll have to be sure you’re ready to try out a device that’s as different as it is. Can also be used as a standalone synth. We love the TRTK49 for beginners. It has great quality and a ton of customization. And finally, at number 10, we have the TRTK49 by Korg. 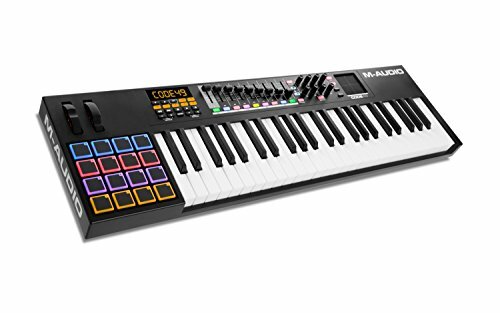 You might be asking, why should you spend this much money on a MIDI controller that has the same number of keys and, most likely, the same features, pads, knobs, and faders? Well, this model simply raises all that to a whole new level. Let’s see exactly how. First of all, the piano keys feel almost like the ones you’d find on a real piano. Though they are semi-weighted, and not fully weighted, pianists will definitely appreciate the effort of the good folks at Korg. Velocity sensitivity is featured, but aftertouch, unfortunately, isn’t. The 16 pads are all made of translucent rubber, in order to let the backlight come through. This is a nice touch especially if you’re on a poorly lit stage or in the studio. The 8 knobs and faders feel very solid and are fairly precise. They are, of course, fully programmable for the various parameters in the DAW of your choice. The TRTK49 has a similar trackpad as the previously mentioned model. However, this time, there are basically 2 surfaces you can control with your fingers. You can use them for many things, such as setting the parameters on the X and Y axis, modulating the current sound, or controlling the cursor on your computer. Definitely a handy addition which makes a mouse and keyboard obsolete. The main feature of the TRTK49 is the fact that it can be used as a standalone synth as well! With the legendary Triton sound engine onboard, just plug it into a PA system and you’re good to go! This definitely makes it the best option for any musician looking for a MIDI controller as well as a standalone synth. Whether it’s in a studio or on a stage, the TRTK49 is definitely hard to beat! First things first, we need to define exactly what a MIDI controller is. It’s basically a device that allows you to control other devices (including your PC) via a set of buttons, knobs, faders, and pads. MIDI stands for Musical Instrument Digital Interface. Simply put, this kind of connection not only allows 2 devices to communicate with each other but translates the keypress or knob turn into a signal that a digital device, such as your PC can understand and comprehend as something you set yourself. One of the more important things to note here is the fact that MIDI controllers don’t create sound on their own. This means you will have to use them alongside either other MIDI devices or as more of a “controlling device” for different parameters. A common misconception is that all MIDI controllers are actually MIDI keyboards. This isn’t true, as there are many models that don’t utilize the standard “piano key” layout. However, all MIDI keyboards are actually considered as MIDI controllers. So, think of MIDI keyboards as just one of many types that MIDI controllers come in. Depending on your personal preferences and needs, some types just work better and offer a more smooth creative experience. Depending on the type of setup you’re using, both in terms of the MIDI device and the rest of the gear you have, a MIDI controller can come in handy in various different ways. Making electronic music, or basically, any genre of music that relies on digital components such as beats and samples is most easily done by using a controller. Sure, you could just open up your DAW of choice and use your mouse and keyboard to control all of the parameters, samples, and plugins. However, this method is not just very slow, but limiting as well. Having a plethora of buttons, knobs, piano keys and faders at your disposal makes the whole ordeal much easier and lets you focus on the actual piece you’re making, and not the technical side. Electronic music, however, is not the only genre that benefits from MIDI controllers. When it comes to recording a band, guitar, bass, and vocals are pretty straightforward. Just plug a microphone or the instrument to an audio interface, and record away. However, if you don’t want to, or simply can’t spend a small fortune on multiple microphones and other pieces of equipment needed for recording drums, a simple MIDI controller can save the day. Just map out the different components of a drum kit to the buttons on the controller, and tap away! If you’re looking for a simple and effective way to record keyboards, a piano-oriented MIDI controller is once again the best solution. It’s pretty clear that MIDI controllers have a wide range of applications in the world of music making and recording. If you think you need one, it’s just the matter of choosing a model with the appropriate specs and features! From a couple of technical details to other, more user-related features, there are quite a few things you should have on your mind! Most people would expect that every MIDI controller actually has a MIDI connection. However, certain brands started implementing a USB connection on the device to cater to the needs of people who mainly use them with a computer. So, unless you plan on using your new MIDI controller alongside just a computer, make sure you double check the actual connection of the model you’re looking into! Depending on the number of keys, additional features, as well as the main purpose, you can find models ranging from very small to almost absurdly large. If a MIDI controller is going to be your main tool/instrument for live performances, I’d recommend going for a bigger model, as getting around all of the keys, knobs, and faders is going to be much more convenient. On the other hand, larger MIDI controllers are usually impossible to fit on an already crowded studio desk. That’s where the smaller models definitely come in handy. Ask yourself if all the features that a certain model has to offer are really that important and if you’re going to use them. If not, a more compact solution may just be better. The actual number of keys on a MIDI controller is an important factor for anyone looking for more of a MIDI keyboard before anything else. Generally speaking, there are 4 main options for you to choose from. 25 Keys – The absolute minimum you are generally going to find. Whether you’re going to focus on playing the piano or using the dedicated keys for something else or not, I strongly recommend getting a model with at least 25 keys, as it will come in handy at one point. 49 Keys – This can be considered as the most popular choice. It hits that sweet spot between convenience in terms of the size of the device, as well as the number of keys you get. 4 octaves should be enough for most users! 61 Keys – If you really need that extra octave, a model with 61 keys is the way to go. 88 Keys – Whether you’re simply looking to get the most out of a MIDI controller, or focus primarily on playing the piano, this is your best bet. These are the most commonly found options when it comes to key number. Certain models offer 32 or even 37 keys, which may appeal to some of you. While having the appropriate number of keys is definitely an important factor, the actual feel of the keys can be a dealbreaker as well. Let’s take a closer look at some of the different solutions the models on the market have to offer. If you plan on using a MIDI controller for not much more than simply inputting drums or simple melodies and beats, this factor may not be that important. Synth Action – Like the name already suggests, this type of keys feels like you’re playing a synthesizer or an electronic organ. It’s definitely different than playing a real piano, but some musicians just prefer the lightweight keys that don’t require that much force applied for them to be activated. Faster styles of playing are definitely easier on this kind of MIDI controllers. Semi-Weighted Action – This type of keys lands in the middle between the previously mentioned synth ones and the next type. If you’re not really sure about what will suit you the best, these may be your best option. Weighted Hammer Action – If you’re looking for the most realistic piano-playing experience, weighted hammer action keys are the way to go. Do have in mind, however, that MIDI controllers sporting this type of keys tend to be noticeably more expensive! While they are not considered as a type of keys in terms of the basic action, Velocity-sensitive keys are definitely worth mentioning. This technology allows you to introduce a layer of dynamics into your playing, as the keys respond differently in accordance with the amount of pressure, or simply put, the speed that you hit them. Just like a real piano would! Depending on what you’re going to use your new MIDI controller for the most, there are a couple of options to consider. Oriented towards mostly using your controller for playing keyboards/piano? Do you mostly use your mouse for controlling the majority of the functions in your DAW of choice? If the answer to either or both of those questions is yes, then definitely go for a MIDI controller that doesn’t have much more than your regular piano keys. Creating beats, modulating effects in real time, and controlling the majority of the plugins and parameters in your DAW is most easily achieved by using a controller with plenty of pads and knobs. If you’re looking for a device that’s used for controlling the rest of your MIDI rig and requires a minimal involvement of your computer, get a controller that has it all. As many keys as you need, multiple pads, knobs, faders, and even a small screen so you can keep track of everything that’s happening on the fly. Do have in mind, however, that these devices tend to be pretty expensive! If you’re not really sure what a certain feature brings to the table or if you even need it, go for a less advanced model. Generally speaking, most MIDI controllers tend to be compatible with the majority of the most popular and widely used DAWs. That doesn’t mean you shouldn’t double check! Some models even come with a software pack included, which can greatly reduce the amount of money you need to spend in the first place if you don’t already have a license for a DAW. Make sure you check if the DAW you’re used to supports mapping all of the knobs, buttons, keys, and faders your potential new controller has to offer. As it is with music equipment, the more you spend, the better the build quality, the sound, and the more features you get. 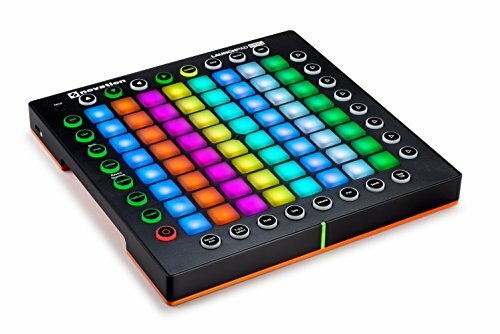 This, however, doesn’t mean that there aren’t any amazing budget-friendly MIDI controllers that won’t burn a hole in your pocket. Whether you’re an absolute beginner, a more advanced musician/audio technician, or a professional, we tried to cover the best models in each and every category. It’s usually a better idea to wait, save up some more money, and get the device you think will suit your needs the best if you’re short on cash at the moment. This is especially a good advice for anyone that makes music which mostly revolves around using a MIDI controller. Set your priorities, think about the most important specs and features, and choose accordingly! With all that being said, let’s take a closer look at the best MIDI controllers you can currently find on the market! As we’ve had the chance to see, there are many different options when it comes to MIDI controllers. Each brand and model with a unique approach and set of features. At the end of the day, it’s up to you to choose the right model for your exact preferences and needs. Don’t forget that most of the models we’ve mentioned come in multiple variations in terms of the number of keys. I hope that this article was helpful, and as always, thank you for reading!